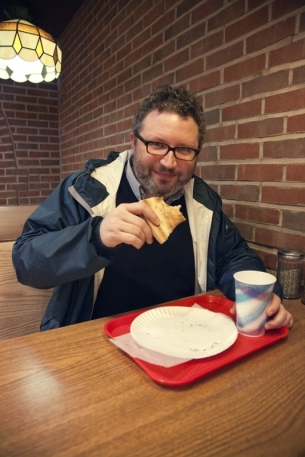 As one of the first wave of food bloggers to hit the net, Adam launched Slice in 2003, becoming the web’s first blog dedicated exclusively to pizza. Three years later he sold it to food critic Ed Levine, who added Slice to his growing Serious Eats family and enlisted Adam as the founding editor. With the guidance of Levine—the man who famously ate 1,000 pizzas in a single year while researching his preeminent book on the subject, “Pizza: A Slice of Heaven”—Slice evolved from a local blog that mapped pilgrimages to the borough’s deepest corners in search of the city’s best pizza, to a comprehensive source of reviews, recipes and innovations that span the world over. MARC SANTO: How has the pizza scene changed since you came to New York City in 2000? ADAM KUBAN: In the late ’90s, Jim Leff, who founded Chowhound.com, released a book called “The Eclectic Gourmet Guide to Greater New York City,” and that became the Bible for underground dining. Leff shouted out Di Fara’s, which was really only on the map of the most extreme food geeks, and locals from Midwood, Brooklyn. Now of course, it’s on every single foodie’s map, but when Chowhound first blew up, going out for “destination pizza” meant going to a coal oven pizzeria. On the site’s message boards, people would usually be arguing the merits of one coal oven place over another. Coal oven dominated the scene for about 100 years, but in the late ’90s La Pizza Fresca quietly opened the first wood oven, Napoletana Pizzeria. They were the first pizzeria in New York to be certified by the Associazione Vera Pizza Napoletana, an organization in Italy that oversees your pizzeria to make sure your dough is hand-pressed with Italian flour and that you’re using ingredients like San Marzano-style tomatoes and Bufala Mozzarella in precise ways. Around 2004 the wood burning and Neapolitan shops started opening up in numbers, and all the marquee pizzerias that foodies name-checked shifted from places with coal ovens to places with wood ovens. MARC: What’s the current scene like? ADAM: In New York we have slice joints, which sell pizza by the slice that are usually cooked in gas ovens, and we have whole-pie-only places, which are the coal or wood oven places that only sell only whole pies. Comparing a slice joint to the whole pie place is like comparing a hot dog stand to a steakhouse. A coal oven place is more family and tourist friendly, but still nicer than a typical slice joint. The Neapolitan places are casual, but nice enough to bring a date to and not feel embarrassed. There’s an artisanal pizza craze, which skews away from purist cheese pies and is much more interested in unique and interesting toppings like Brussels sprouts and pancetta at Motorino, or the corn pizza at Co. Another good trend is the lemon slice, which may sound weird on a pizza, but if it’s done well it really works. Roman-style shops have begun popping up as well, and they’re essentially a kissing cousin to a New York slice joint. The pies are rectangular and thinner, but served by the slice, which typically come as a plain tomato slice or one topped with potato or arugula. MARC: California tomatoes seem to be the new ingredient of choice. Have they replaced San Marzano? ADAM: San Marzano starts a huge fight among pizza nerds. For a number of years people were all about San Marzano, but there’s been a shift from people being into San Marzano to people being into Italian-style tomatoes and caring more about the flavor of tomato than where it came from. We’ve done taste tests where we’ve tasted San Marzano tomatoes, California tomatoes and San Marzano DOP tomatoes, which are the ultra-regulated regional tomatoes from Italy. California tomatoes did really well, whereas the DOP style was near the bottom. With a pizza, you want to taste the sauce, but there are other important factors to consider. You don’t want to see a blob of cheese that’ll sit in your stomach for the rest of the day. You also don’t want to see so much grease that it’ll end up dripping down your arm, although there’s definitely a group of people who like it that way. You want to see a little charring on the crust and you don’t want to see a blonde rim because then it’ll be predictably bland, soft, and chewy, but not crisp. MARC: Which borough has the best pizza? ADAM: I don’t want to give them swollen heads because Brooklynites already have big heads, but overall Brooklyn has the best pizza. Brooklyn has all the different varieties of pizza and they’re constantly ranked at the top or near the top in all categories. Best Pizza in Williamsburg does a great New York-style pizza, and Paulie Gee’s in Greenpoint has excellent Neapolitan style. L&B Spumoni Gardens in Bensonhurst makes quality Sicilian, and Lucali’s in Carroll Gardens does a hybrid of a high- and lowbrow pie. Franny’s is super highbrow, and DeFara’s is always the elephant in the room. What’s more interesting is the pop-up pizzerias that places like Pizza Moto and Roberta’s are doing, where they’re putting wood ovens on the back of a cart and carting pizzas around the city. The volume of the pizza scene is huge and so many people are competing in it that everybody is constantly trying to outdo each other. That’s part of the reason why New York pizza continues to be so great.